Bronze Age items which were excavated in Wiltshire 200 years ago are to go on display in the county after spending recent years in a bank vault. The new Prehistoric Galleries will display Wiltshire's gold and amber finds dating back to before 2,000 BC. Museum director David Dawson said he was "absolutely delighted". Avalon Marshes in Somerset has been given £1.8m by the Heritage Lottery Fund (HLF) to pay for improvements. The money will help preserve habitats and archaeological features, and create new paths and bird hides. Visitor facilities will also be upgraded. The area near Glastonbury is said to have 10% of the UK's reedbeds - a habitat that supports wildlife such as marsh harriers, bitterns and otters. In total £2.5m will be invested in the scheme. A team of scientists has announced the discovery of a 3.4 million-year-old partial foot from the Woranso-Mille area of the Afar region of Ethiopia. The fossil foot did not belong to a member of “Lucy’s” species, Australopithecus afarensis, the famous early human ancestor. Research on this new specimen indicates that more than one species of early human ancestor existed between 3 and 4 million years ago with different methods of locomotion. The analysis will be published in the March 29, 2012 issue of the journal Nature. The partial foot was found in February 2009 in an area locally known as Burtele. The biggest hoard of celtic silver coins ever found in Switzerland has been unearthed in the village of Füllinsdorf, in the northwestern canton of Basel Country. Announcing the find on Thursday, the cantonal archaeological department said it consisted of 293 silver coins, found scattered over an area of about 50 square metres only a few centimetres below the surface. 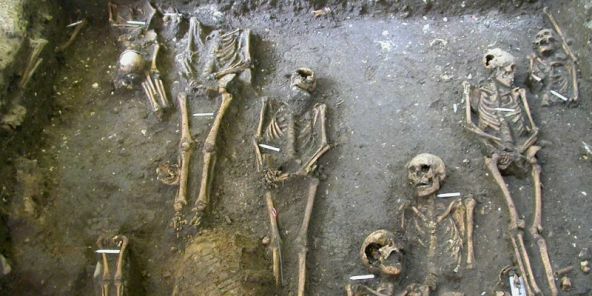 However, cantonal archaeologist Reto Marti said they had probably originally been buried together. The coins are small: about a centimetre across and weighing barely two grams. It is not known what they would have been worth. All cattle are descended from as few as 80 animals that were domesticated from wild ox in the Near East some 10,500 years ago, according to a new genetic study. An international team of scientists from the CNRS and National Museum of Natural History in France, the University of Mainz in Germany, and UCL in the UK were able to conduct the study by first extracting DNA from the bones of domestic cattle excavated in Iranian archaeological sites. These sites date to not long after the invention of farming and are in the region where cattle were first domesticated. The team examined how small differences in the DNA sequences of those ancient cattle, as well as cattle living today, could have arisen given different population histories. 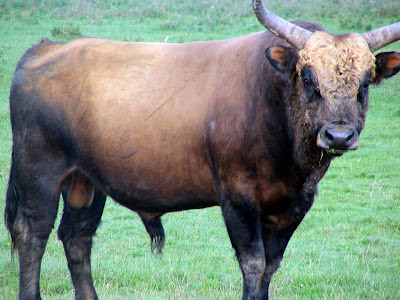 Using computer simulations they found that the DNA differences could only have arisen if a small number of animals, approximately 80, were domesticated from wild ox (aurochs). 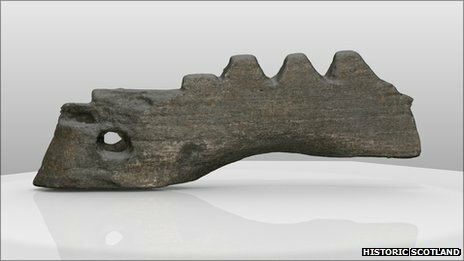 ONE of the earliest stringed instrument ever found in Western Europe - dating to more than 2,300 years ago - has been discovered at an excavation on the Isle of Skye. Scottish Government Cabinet Secretary for Culture Fiona Hyslop has revealed the small wooden fragment that it is believed comes from a lyre. It has been burnt and broken, but the notches where strings would have been placed are easy to distinguish on the artefact. 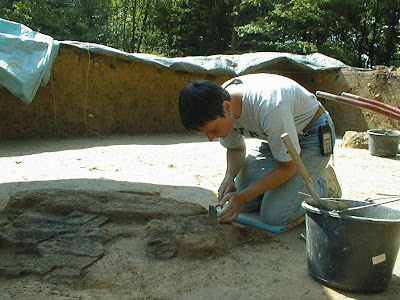 Music archaeologists Graeme Lawson and John Purser studied the fragment which was discovered at High Pasture Cave, near the village of Torrin. The small burnt and broken piece of carved piece of wood was found during an excavation in a cave on Skye. 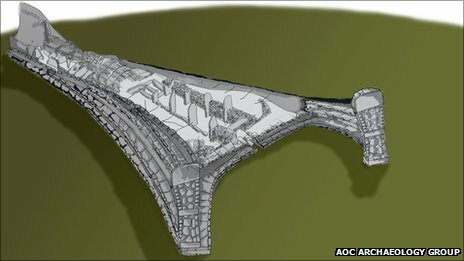 Archaeologists said it was likely to be part of the bridge of a lyre dating to more than 2,300 years ago. Music archaeologist Dr Graeme Lawson said the discovery marked a "step change" in music history. As the "Information Society" has matured, interaction with digital worlds through virtual systems and multimedia is finally reaching everyday users. The last few years have witnessed a dramatic growth in 3D "consumer" technology (from stereoscopic television to 3D interaction devices for videogames and from 3D gesture control for tablet computers to augmented reality on smartphones), together with a progressive increase in broadband digital infrastructure. Virtual and augmented reality technologies, once the domain of elite laboratories, are now commonplace. From cultural heritage, where 3D content is today almost a requirement, to medicine, the arts, film, and games, quick and accurate 3D content generation and its remote manipulations is increasingly important. What is next? Will virtual visits supplant actual tourism, or will the virtual create greater need to see the real? How will ubiquitous 3D change everyday life? 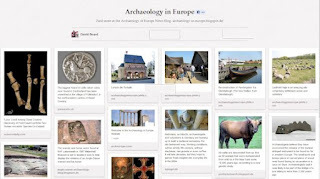 The iPad is an ideal tool for field archaeology. Yes, but it needs some protection before taking it into the field. After looking seriously at the wealth of protective cases offered for the ipad, I have come to the conclusion that the best protection is offered by the Drop Tech Series iPadCase. The standard model has a thick rubber surround with Reinforced rubber bumpers on the corners. the screen is protected by a replaceable screen cover - no lifting or removing a cover - your iPad is protected during use and the touch screen is every bit as responsive with the cover in place. If you want even more protection, then you can try the Military Edition, which has a thicker rubber case. An impressive video on the Drop Tech site shows a paintball gun being fired at the iPad's screen. The iPad suffered less damage than the poor guy holding it! Five telescopes made of bone and dating to the 18th century have been discovered in Amsterdam, with two of the scopes found in the equivalent of toilets. At the time, called the Enlightenment, the telescopes would have been considered luxury items and were likely used to gaze at objects on land or sea, rather than to look at the stars. They were created during a period when Amsterdam was a flourishing center for trade, one that attracted talented craftsmen. Ranging in length from roughly 3 to 5 inches (80 to 140 millimeters), the telescopes were made using cattle metatarsal bone. "This particular bone of cow, the metatarsal bone, is actually quite straight and round," Marloes Rijkelijkhuizen, of the Amsterdam Archaeological Centre at the University of Amsterdam, told LiveScience. "It's a nice shape to make these telescopes from, it's straight and (has a) very round narrow cavity." 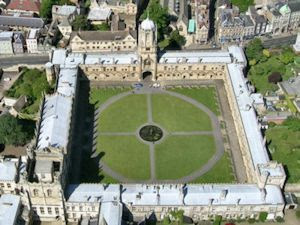 The biggest excavation in York was completed last year. 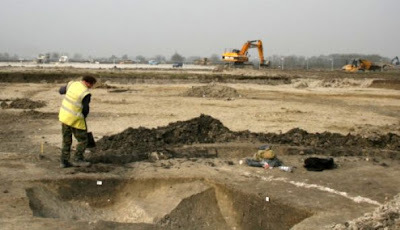 Now we have a chance to see some of the treasures unearthed by archaeologists at Hungate. MATT CLARK takes a look. HE died two thousand years ago. Nobody knows who he is, nobody knows what he did and it’s anyone’s guess what killed him. But one thing is for sure, this skeleton is Roman and one of more than 100 found at Hungate by York Archaeological Trust during the city’s most important dig since Coppergate. It’s one of thousands of objects unearthed at the site and Looking Back At Hungate, which opened at DIG on Saturday, will display many of them on a rotating basis until April next year. One of the largest collections of Roman coins -- over 30,000 silver pieces -- has been recovered in England from the building site of a new hotel in Bath, just 450 feet from the historic Roman Baths. Known as the Beau Street Hoard, from the street where they have been unearthed, the coins date to 270 A.D., a time of great upheaval when the western Roman empire was threatened by civil war and barbarian invasion. Aware of the difficult times, the owner might have just decided to hide away the treasure. Ravagers, despoilers, pagans, heathens - the Vikings are usually regarded as bloodthirsty seafaring pirates, whose impact on Europe was one of fear and terror. As they plundered the British Isles and the north Atlantic, these pagan invaders were seen by their Christian victims as a visitation from God. Yet the Vikings were also traders, settlers and farmers with a highly developed artistic culture and legal system. Their network of trade routes stretching from Greenland to Byzantium and their settlements, resulted in the creation of the Duchy of Normandy in France, the foundation of the Kingdom of Russia in Kiev and Novgorod as well as the development of Irish towns including Cork, Dublin and Limerick. This course will use recent findings from archaeology together with documentary records, to examine these varied aspects of the Viking world and to give a detailed and balanced view of this fascinating period. Archaeologists working at an east London Crossrail site have uncovered remains of the historic Ironworks and Shipbuilding Company. Work is under way at Limmo Peninsula, by Canning Town, to record the remains of the shipyard, which shut in 1912. The firm employed thousands of people to build ships for navies worldwide. Crossrail said details of the shipyard were documented before digging began so it had incorporated the excavation work into its construction programme. Australian scientists have concluded that human hunting caused the extinction of the ancient giant animals – or megafauna - that roamed the continent and vanished about 40,000 years ago. A new study on the hotly-debated mystery, published in Science, blames humans rather than climate change for the demise of the massive plant-eating animals such as 300-kilogram kangaroos, birds that were twice the size of emus and a leopard-sized marsupial lion. Various theories have been promoted to explain the demise of the megafauna, including the use of fire and climate change. "The debate really should be over now," said John Alroy, from Sydney's Macquarie University. "Hunting did it, end of story." It is thought the remains are those of 15th century Franciscan monks known to have lived in the town. The find — just six inches below the road's surface — has excited Fife Council archaeologist Douglas Speirs, who has long tried to pinpoint the exact location of the monks' ancient burial ground. The resurfacing work in Greyfriars Gardens has been temporarily abandoned to allow the site to be excavated and the remains preserved. For three centuries, the Plan of Saint Gall has inspired a vast number of architects and even more historians. Yet, it had never been realised in full scale – until today. Inspired by the amazing project of building a medieval castle at Guédelon in France, a registered non-profit society called "karolingische klosterstadt e.V. "1 (Carolingian Monastic City) has accepted the challenge to build the fictitious abbey as it is shown in the manuscript (Codex 1092) within a period of 30 years, applying methods and tools of the early ninth century. Building a Long Lost Idea? We2 had been asked by the above mentioned society to explore the aspects of building a living history site with staff in period costume, portraying construction and everyday life as well as the monastic culture of the Carolingian times – a period setting stage for our common medieval heritage – in the microcosm of an almost autonomous abbey. 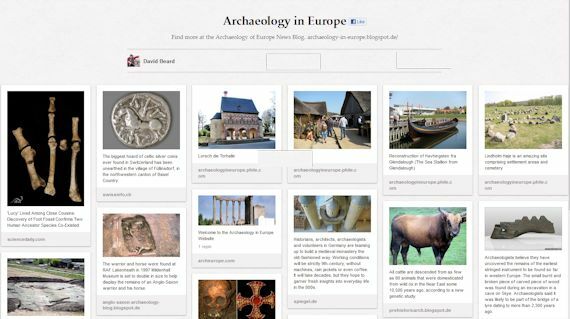 If the society's ambiguous idea for a medieval construction site of this size will be realised, new avenues for communicating archaeological and historical information to the German public will open up, while at the same time serious questions in terms of interpretation and quality management arise. 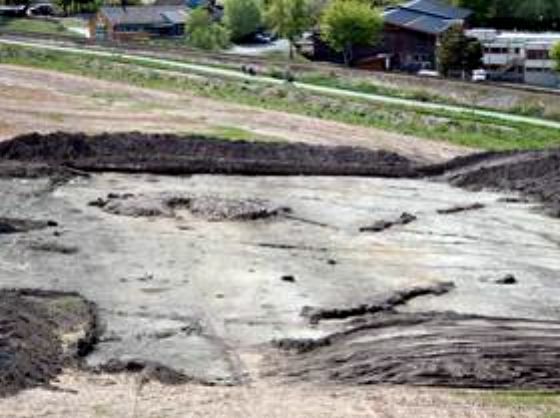 Archaeological excavations in 2009–2011 at Kanaljorden in the town of Motala, Östergötland in central Sweden unearthed a unique Mesolithic site with ceremonial depositions of human crania in a former lake. The human skulls have been part of a complex ceremony that involved their display on stakes and deposition in water. The skulls have now been C14 dated to 6212-5717 cal BC and two dates on worked wood have also been obtained (5972-5675 cal BC), making them 7-8000 year old. Historians, architects, archaeologists and volunteers in Germany are teaming up to build a medieval monastery the old-fashioned way. Working conditions will be strictly 9th-century, without machines, rain jackets or even coffee. It will take decades, but they hope to garner fresh insights into everyday life in the 800s. What did a medieval stonemason do when heavy rainfall interrupted his work? Umbrellas are impractical at construction sites. Gore-Tex jackets weren't yet invented, nor were plastic rain jackets. "He donned a jacket made of felted loden cloth," says Bert Geurten, the man who plans to build an authentic monastery town the old-fashioned way. There is also a You Tube video about the project (in German). Hundreds of Bronze and Iron Age sites have been unearthed by archaeologists in part of the Highlands. The £100,000 archaeology project has revealed 300 sites over West Caithness. The project, funded by Baillie Wind Farm, involved Scotland's first large-scale survey using LiDAR - light detection and ranging - technology. The equipment can map ancient sites in fine detail and reveals 3D images of their shapes, size and content. As part of the project a cluster of seven Neolithic cairns will be unveiled to the public for the first time. Vikings who conquered new lands unwittingly brought with them another sort of invader, a new DNA study says—mice. Scientists studying the evolution of house mice already knew about a DNA pattern found only in mice in what's now Norway, a Viking homeland, and northern Britain, which Vikings colonized, said study leader Eleanor Jones, a population biologist at Uppsala University in Sweden. The finding suggested to Jones and her team that the two populations, despite being separated by the sea, were related and that Vikings had possibly brought the mice to northern Britain. The new study tested modern and ancient mouse remains from the sites of known Viking colonies and found the same telltale pattern, adding weight to the idea that the mice were brought by Viking colonizers. A leading archaeologist has described the discovery of what is a likely “prehistoric” antler hammerhead at a Burren cave as hugely exciting. Dr Marion Dowd of IT Sligo said a 10-day excavation at a small cave on Moneen Mountain outside Ballyvaughan, Co Clare, also produced the “poignant” discovery of a skeleton of a teenager thought to have sought shelter in the cave. Carbon dating found the skeletal bones date from the 16th or 17th century. The skull of the skeleton and the antler hammerhead were discovered by cavers last June, prompting the National Museum Service to fund the excavation led by Dr Dowd last August. An antler hammerhead found in a Burren cave is "likely to be prehistoric". Along with the "hugely exciting" hammerhead find, archaeologists also came across the skeleton of a teenager who carbon dating suggest sought shelter in the cave sometime in the 16th or 17th century. The skull of the skeleton and the hammerhead were discovered by cavers last June in a small cave on Moneen Mountain outside Ballyvaughan, Co Clare. The National Museum Service then carried out a 10-day excavation last August. Presenting the findings in Tubber last night, lead archaeologist Marion Dowd of IT Sligo said the cave was used in the Bronze Age about 3,000 years ago, and again at the end of the Medieval period. Photos: Bejeweled Anglo-Saxon Found in Christian "Burial Bed"
The skeleton of a young Christian noblewoman, who was laid to rest on a "burial bed" some 1,400 years ago, is giving archaeologists precious clues to the earliest days of the English church. Unearthed in 2011 in a village near Cambridge (map), the teenager wore the badge of her faith in the shape of an exquisite gold-and-garnet cross, found on her chest and just visible in the picture above. The ornate treasure marks the grave as one of the earliest known Christian burials in Anglo-Saxon England, researchers from the University of Cambridge announced last week. A wind farm developer has paid for archaeologists to scan a cluster of seven Neolithic horned cairns near to where 21 turbines will be erected. The 5,000 year old structures at Hill of Shebster, near Thurso, in Caithness, were used for burials and rituals. Light Detection and Ranging (LiDAR) equipment was used to map the cairns. Edinburgh-based AOC Archaeology also recorded 300 new Bronze and Iron Age sites in the £100,000 project funded by Baillie Wind Farm. The new sites included hut circle settlements. Reaching into its medieval past, Norway has revived an old pilgrim path as a challenging long-distance walking trail with possible spiritual vibes. 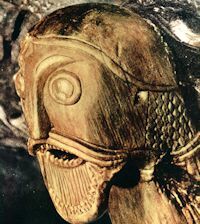 Called St. Olav’s Way after the country’s patron saint, it follows the footsteps of pilgrims to Trondheim, called Nidaros in the Middle Ages, and the earthly remains of St. Olav buried under its great cathedral. In life, the saint was King Olav Haraldsson, credited with sealing Norway’s conversion to Christianity with a martyr’s death in battle in 1030. He was rushed into sainthood a year later. His spreading fame made Nidaros a major destination for European pilgrams, along with Jerusalem, Rome and Santiago de Compostela in Spain. Pilgrims trod St. Olav’s Way until Lutheranism reached Norway in 1537, shutting down saint worship. Artefacts are usually displayed in museums but sometimes there are some that just can’t be put on exhibition – as is the case with one that is hidden deep in the Russian forests. It was known that there were rock carvings on some islands in Lake Kanozero, and Jan Magne Gjerde, project manager at the Tromsø University Museum, went out there to document them as part of his doctoral work however, when he and his colleagues had completed their work, the number of known petroglyphs had risen from 200 to over 1,000. Skeletons recovered from the wreck of a King Henry VIII's warship the Mary Rose are being studied to discover more about life in the 1500s. Swansea University sports scientists are hoping to find out more about the toll on the bodies of archers who had to pull heavy bows. It is documented that archers were aboard the ship when it sank in 1545. The wreck was raised from the Solent in 1982, containing thousands of medieval artefacts. Mice hitched a ride with Vikings to mount their own invasions in the 10th century, research has shown. A genetic study shows that Viking longboats carried the weeny Norse warriors to colonies in Iceland and Greenland. Scientists compared modern mouse DNA with ancient samples from mouse bones found at archaeological sites. The analysis showed that the house mouse, Mus musculus domesticus, hitched lifts with Vikings in the early 10th century from either Norway or the northern British Isles. Descendants of these stowaways can still be found in Iceland where DNA samples were collected from nine sites. A fascinating discovery is shedding light upon pre-Christian Scandinavian religion and early Christian inroads into Norway. In the Norwegian press, this highly important find is being called "unparalleled," "first of its kind" and "unique," said to have been "deliberately and carefully hidden" - from invading and destructive Christians. Located at the site of Ranheim, about 10 kilometers north of the Norwegian city of Trondheim, the astonishing discovery was unearthed while excavating foundations for new houses and includes a "gudehovet" or "god temple." Occupied from the 6th or 5th century BCE until the 10th century AD/CE, the site shows signs of usage for animal sacrifice, a common practice among different peoples in antiquity. Over 1,000 years ago, the site was dismantled and covered by a thick layer of peat, evidently to protect it from marauding Christian invaders. These native Norse religionists apparently then fled to other places, such as Iceland, where they could re-erect their altars and re-establish the old religion. Excavations for house foundations at Ranheim, Norway, have uncovered a small "gudehovet" or "god temple," a structure used by pre-Christian Pagan peoples. Used from around the eighth or ninth centuries BCE until the 10th century AD/CE, the site is well preserved because it was covered over by its worshippers with a thick layer of peat, apparently in order to protect it from marauding Christians. It is surmised that the site's inhabitants fled Christian invaders, who were known to slaughter the natives and destroy their sacred sites. The covering over of the site coincides with an exodus recorded in ancient Norse sources, around the time of the first Norwegian king, Harald Fairhair (872-930). These Norse writings were later composed in Iceland, relating that some 40 people had come there from the area of Trøndelag, Norway. Regarding this discovery at Ranheim, head archaeologist Preben Rønne of the Science Museum/University of Trondheim remarked, "Indications are that the people who deliberately covered up the god temple at Ranheim took the posts from the stave house/pole building, in addition to the soil from the altar, to the place where they settled down and raised a new god temple. Because our findings and the Norse sources work well together, the sources may be more reliable than many scientists believed." New research carried out at the University of York and published in BMC Evolutionary Biology has used evolutionary techniques on modern day and ancestral mouse mitochondrial DNA to show that the timeline of mouse colonisation matches that of Viking invasion. During the Viking age (late 8th to mid 10th century) Vikings from Norway established colonies across Scotland, the Scottish islands, Ireland, and Isle of Man. They also explored the north Atlantic, settling in the Faroe Islands, Iceland, Newfoundland and Greenland. While they intentionally took with them domestic animals such as horses, sheep, goats and chickens they also inadvertently carried pest species, including mice. A multinational team of researchers from the UK, USA, Iceland, Denmark and Sweden used techniques designed to characterize genetic similarity, and hence the relatedness of one population, or one individual, with another, to determine a mouse colonisation timeline. Hidden in the landscape of the fertile crescent of the Middle East, scientists say, lurk overlooked networks of small settlements that hold vital clues to ancient civilizations. The secrets locked in five historic Roman burial urns are being uncovered at the Wiltshire and Swindon History Centre in Chippenham. Kelly Abbott, contract conservator with Wiltshire Council Conservation Service, said the dusting away of years of history from the urns has uncovered bones that could be human. More than a decade after its discovery, one of the finest archaeological finds ever to be made in Perthshire has finally gone on public exhibition. Visitors are expected to flock to the Perth Museum and Art Gallery to view the 3,000-year-old Carpow logboat. It has taken years of painstaking restoration and conservation to ready Scotland's oldest example of one of the first known boats for display. The logboat made its long-awaited return to Perthshire last month, when it was manoeuvred into Perth Museum in sections. It has now been made whole again and takes centre stage in a major new exhibition on the boat's story and its Bronze Age origins, which opened on Monday. One of the country's finest examples of Roman archaeology is being shown to members of the public following an 18-month conservation project. 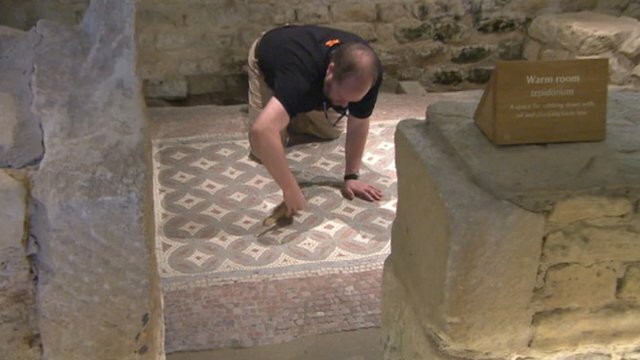 Some of the mosaics at Chedworth Roman Villa in Gloucestershire have not been on display for more than 150 years but a new building has now been built to protect and better display them for years to come. Archaeologist Katherine Rinne stands beside a large ancient Roman springhouse that may belong to the lost “Carestia” spring, one of the possible sources of the Aqua Traiana. Few monuments that survive from antiquity better represent Roman pragmatism, ingenuity, and the desire to impress than the aqueducts built to fulfill the Romans’ seemingly unslakable need for water. Around the turn of the second century A.D., the emperor Trajan began construction on a new aqueduct for the city of Rome. At the time, demands on the city’s water supply were enormous. In addition to satisfying the utilitarian needs of Rome’s one million inhabitants, as well as that of wealthy residents in their rural and suburban villas, water fed impressive public baths and monumental fountains throughout the city. Although the system was already sufficient, the desire to build aqueducts was often more a matter of ideology than absolute need. Whether responding to genuine necessity or not, a new aqueduct itself was a statement of a city’s power, grandeur, and influence in an age when such things mattered greatly. Its creation also glorified its sponsor. Trajan—provoked, in part, by the unfinished projects of his grandiose predecessor, Domitian—seized the opportunity to build his own monumental legacy in the capital: the Aqua Traiana (“Aqueduct of Trajan” in Latin). A Roman burial site, an ancient parish boundary and Iron Age artefacts have been discovered on the site soon to house the world’s biggest dairy. Archaeologists have now completed a 12-week study at the site of Arla’s new dairy at Aston Clinton. Among the artefacts discovered on site were the remains of the last occupants of the Roman settlement. These will now be reinterred at Buckland Cemetery once they have been analysed. Other items found were quantities of pottery, including high status Samian ware and animal bone. FROG Training - Book Now! Was Human Evolution Caused by Climate Change?